A young mother develops allergies immediately following the birth of her first child. fluid retention, breast tenderness as well as allergies. A menopausal woman begins to notice new allergy symptoms cropping up with each season. All three women are in unique stages of life. All three are experiencing a sudden onset of allergies and yet, not one has made a geographical change. What’s the common thread? Childbirth, perimenopause, and menopause are all times during a woman’s life in which she is especially susceptible to hormonal imbalance. 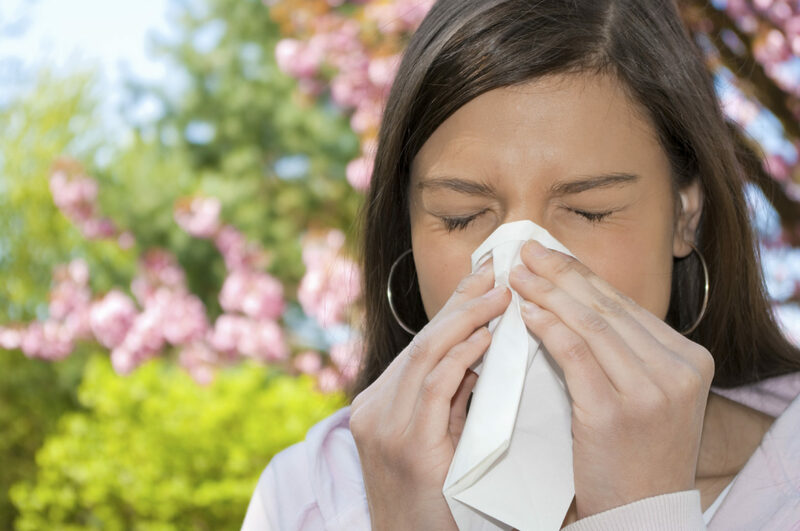 Often, allergies make their debut during these times as well. You might be surprised to learn that estrogen dominance plays a large role in the abrupt occurrence of allergies. Estrogen actually promotes the release of histamine. Histamine is the chemical that is responsible for pesky allergy symptoms such as watery eyes, coughing and nasal congestion. The allergy/hormone connection is furthered by the relationship between progesterone and cortisol. Cortisol is your body’s natural anti-inflammatory hormone and is produced in the adrenal glands from progesterone. Because adequate levels of progesterone help to balance the effects of estrogen, estrogen dominance can also be called progesterone deficiency. When your body is deficient in progesterone, it will experience a decline in cortisol levels as well. This hormonal imbalance can be what causes new mothers, middle-aged women experiencing the symptoms of estrogen dominance, and women whose ovaries are no longer producing progesterone to exhibit a sudden onset of allergies. Before you patch up the symptoms, find the underlying cause. You might be surprised to find other seemingly unrelated symptoms will soon disappear when you address the problem at its source. Find out if you have symptoms of hormone imbalance – take our symptom checker quiz today.